Product Description: Skylarks, GSXs, Grand Nationals, Rivieras, Gran Sports; the list of formidable performance Buicks is impressive. From the torque monsters of the 1960s to the high-flying Turbo models of the '80s, Buicks have a unique place in performance history. During the 1960s, when word of the mountains of torque supplied by the big-inch Buicks hit the street, nobody wanted to mess with them. Later, big-inch Buicks and the Hemi Chryslers went at it hammer and tongs in stock drag shootouts and in the pages of the popular musclecar magazines of the day. The wars between the Turbo Buicks and Mustang GTs in the 1980s also were legendary, as both cars responded so well to modifications. For years enthusiasts of General Motors vehicles that were not Chevys have had to struggle to find information about performance modifying their beloved Oldsmobiles, Pontiacs, and Buicks. It seems that every other performance book was another twist to modifying the small- or big-block Chevy, with nothing on the other General marques. The magazines haven't been any better. With the recent publication of our How to Build Max-Performance Pontiacs book, and now this book, all of that is changing! Enter How to Build Max-Performance Buick Engines! 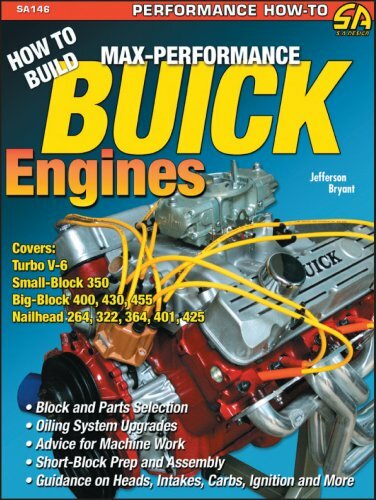 How to Build Max-Performance Buick Engines is the first performance engine book ever published on the Buick family of engines. This book covers everything from the Nailheads of the '50s and early '60s, to the later evolutions of the Buick V-8 through the '60s and '70s, through to the turbo V-6 models of the '70s and '80s. Veteran magazine writer and Buick owner Jefferson Bryant supplies the most up-to-date information on heads, blocks, cams, rotating assemblies, interchangeability, and oiling-system improvements and modifications, along with details on the best performance options available, avenues for aftermarket support, and so much more. Finally, the Buick camp gets the information they have been waiting for, and it's all right here in How to Build Max-Performance Buick Engines!